Spring! Clear blue skies. Crisp fresh air. Yes, spring was here for a couple of weeks and then Old Man Winter decided he hadn't spent enough time with us and came back with a bang. There was ice everywhere yesterday and today, there's snow. 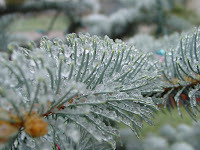 My yard and my plants are adorned with nature's icy diamonds. It's cold, very cold. Back in the upper teens and it's perfect weather for kanda bhajji, the disco version of which sounds even more attractive. 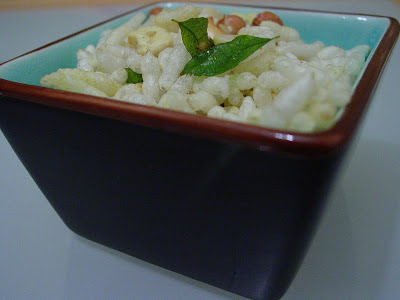 But I placed steel over my heart and made another favorite, a low-cal spicy crunchy treat made with kurmura or puffed rice, called bhadang. (Said: bhuh-dung). Bhadang brings back many memories of my Mom. This used to be one of my favorite snacks to munch on while I pretended to study for my exams. My hand would get slapped very often as I tried to sneak some peanuts. Or when she wasn't looking, I'd grab a fistful of kurmure and dart back to the dining table which I took over in the name of studying. It's funny how I see history repeat itself. No, Medha was not studying for any exams (thank God!) but she sure was reducing the quantity of peanuts with each hug that she had to give me. When I put the peanuts out of reach, I started losing some of the kurmure with each loving visit! Heat oil in a large kadhai. Add the mustard seeds and when they pop, add hing. Reduce the heat and add cumin seeds, sesame seeds, peanuts and cashews. Sesame seeds tend to jump right out of the hot oil into your eyes, so watch out! Add the chopped green chillies and curry leaves. They too will sizzle because of their water content so sometimes it helps to be ready with a splatter proof lid for the kadhai. Allow the green chillies to get nicely fried in the oil. Add the red chilli powder, turmeric powder, and methi seeds. Next add the kurmura and toss until it is nicely coated with all the yummies in the oil. Add sugar, salt and citric acid crystals and toss about a little more. 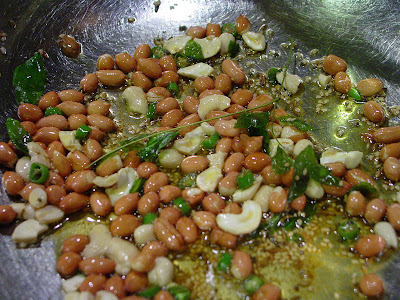 Continue to heat on low, mixing and tossing constantly, until the kurmura are crisp and spicy. Your bhadang is ready! Serve immediately with a hot cup of tea or coffee. This can be stored for up to a week. Mine never lasts beyond a day! 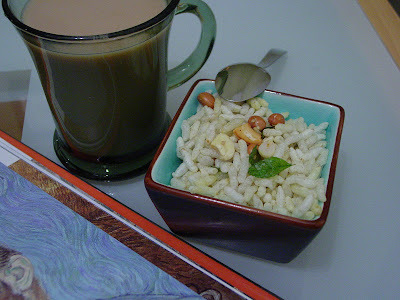 When I didn't have easy access to an Indian grocery store, I used to make bhadang with Kellogg's Rice Crispies. It's not quite the same and I would use more green chillies to get the taste I craved. Nupur has an interesting twist on bhadang with garlic and raisins. Or you could simply order some Spicy World Bhadang from Amazon. Hang on to winter...soon it will be too hot for tea. And such spicy snacks are made for summer afternoons, when oily heavy bhajjias are furthest from the mind. That iced cherry plum is looking so deliciously cool. Kellogg's rice crispies are sweetened? ...like a jhatpat chivda. Great to satisfy the snack cravings without the guilt pangs (of bahjjis) later. 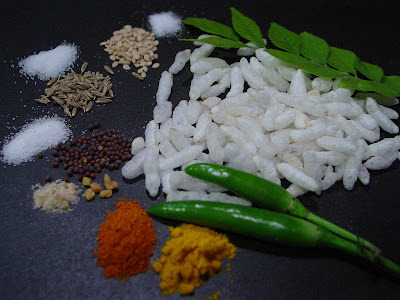 Bongs also have their quick version - the jhal muri - that I want to try. Untoasted mustard oil...mmmm... spicy in a different way! still icy and cold!! the weather here is getting better but still i think it is globalcooling with long winters:(. I love this stuff with some tea...and yes, the peanuts are my favorite part! Anita, Kellogg's Rice Krispies are sweet. Not as overwhlemingly sweet as the other cereals but sweet nevertheless. They have sugar and glucose-fructose syrup. Yes, this is a quick chivda and you can make it as spicy as you want. I prefer to make it more tikhat with green chillies than red chilli powder though. It goes really well with masala chai. Reena,a belated welcome to you! It's probably global warming. The mountains (Rockies) got a lot of snow this fall and winter but this March was warm and dry and typically they pick up 20% of their annual snow in that month. The snow cover is down to 71% which is more than a little disconcerting. New England is where the snow is now! Abhi, we get basmati murmura or just plain murmura. I've made bhadang with both without any problems. Since the basmati kurmure are rather delicate, use as little oil as possible so that they stay intact and become crispy. I feel for you. Almost a foot of snow is no fun on Easter. We got more than a dusting and it's mixed with ice. 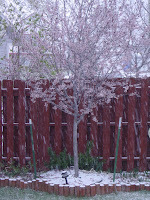 Trupti, spring snowstorms are not uncommon for us in Colorado. We get hailstorms, too. It passes rather quickly but this is different and it is lingering. Ice everywhere, back to slipping and sliding on the roads - those 50lb bags of salt in the trunk really help give more traction esp since our roads are generally not plowed or salted. If you have roasted chana dal (dalia), then you could add that, too. I just like the peanuts! The cashews are for my husband. Bee, are your Rice Krispies from Kellogg's? Or are these generic / unbranded rice crispies? Sig, no! Not in Seattle. Although about 6 years ago there was a fair chance of relocating there. The thought of good seafood made me happy for a while. But I am very happy here with the 300+ days of sunshine and the mountains around me. It's finally stopped snowing and most of it has melted away already. Please let the warm-up begin! Bee!, you guys are too funny! Dried cranberries and sunflower seeds is a great twist! So much healthier, too! So it's Malt-O-Meal? Have you tried their equivalent of farina? It has malted barley in it. I use it for sanjha/upma. When I am dry-roasting the farina, my kitchen smells like Ovaltine. The upma has a slightly different flavor but we really like it. Abhi, maybe you want to try the unsweetened rice crispies that Bee used. They look chunkier than kurmure for sure! Our neighborhood egg hunt works this way: you drop off 12 plastic eggs filled with candy at the designated house by Friday. The older kids then go to the park early in the morning and hide eggs in easy spots for the toddlers, and tougher spots for the rest. Everyone gets to find 12 eggs and go home with other people's candy. Last year they had chucked eggs into the open space around the park and the kids kept disappearing into the brush and every so often we'd hear shouts as they found an egg. So no real eggs are hurt in this process. So what do you do when you make egg curry? You make something different for the kids? Did you read about Prajakta's disco bhajji? If you want to boogie some tonight, you know where to look for the twice-fried disco bhajji recipe! Save some for me, i am making some chai. Crispies are so delicious to have with chai. Had some bhadang y'day for evening tea :) and i am always looking for more :)). Hey, i love snow.....chai and murmura in snow.....ahaaa! especially with moongphali! it's not malto-meal, manisha. dunno which brand. threw the packet away. will look for that brand of farina, though. Our community has a common-area-park-like thingy. Which is were the egg hunt happens. Enthu people hide the eggs, kids find it and trade it for candy. The problem is my kids, starved for eggs as they are, would never trade. Do you know there are people out here who look for reflections on the spoons? Not me. I will give you proof. :D Now I got to go and complete that JFI stuff. Tomorrow is the deadline I have given to myself. Proof: Read through the comments of this post, and this post. Manisha smell of Nagpur isn't it! Amsul in the fodni too is yum. Do you get those stout kurmure there? Try bhadang with it if you do get it its just different. Vee, I lusted after those bhajjis and then quietly made bhadang. I am almost competition for Silky Smitha in any case! Too bad for your kids. Although I would have happily given up eggs when I was a kid. Hated the smelly yolk. RP, you made me look in the spoon! Now I am going to look into every spoon. Not just mine. But everyone's!! The last picture with the famous ear is on my dining table. Sig and I share very good taste when it comes to picking dining tables. What, Sig? Kuchh bhadang bachhi hai kya.....i'll make tea :). First, Abhi and now you, Anjali! I'll ask the grocer when I go next. As for amsol in the phodni, never had it. But I can imagine the taste! Doesn't it make the bhadang soggy though? Consistency is important - never lose sight of that. I thought "Golden Girl" when I saw your comment over at Bee's, Musical. You know the first time I made this, my husband thought I was abusing him or something. He has this way of saying What is this Bhadang? Just like he said What is this Patal Bhaji...And of course I am here, where else will I be? Coffee ban rahi hai. I'm thrilled you took bait, Anita! The other day I made a statement about how I would give 10% to someone and the remaining 85% I would give to someone else and no-one even noticed that there was 5% unaccounted for. After a while I wondered if there really was 5% unaccounted for and if 10% + 85% = 100%. OMG, i never thought bhadang would sound abusive ;). Loved your blush emoticon btw. Hopefully, it's spring again from tomorrow. It's going to flurry and snow through the night and then spring will be back...I hope! Observant? Who cooks with models anyway? Not me! But, truthfully, I find counting spice quite a pain. But I am doing it myself these days!! When writing a recipe, sometimes the teaspoon is not the right measure. So I was counting peppercorns for one recipe, and for the tomato chutney I picked up as many red chillies as I wanted to use and then counted them! [returning to subject at hand] But methi is not as unforgiving as Maharashtrians tend to feel. My MIL also kept this tiny glass bottle with methi seeds in the masala dabba. I was shocked. It is that North-South dicotomy at work again. You will not find tiny bottles of anything in a North Indian kitchen (Musical, back me up here) :-) And she would almost count the methi seeds when adding to the tadka. I go ahead and use my (her) masaala dabba spoon (which is about half a regular teaspoon) and my kadhi is none the worse for it. My MIL never used mustard and zeera in the same dish ever - so this bhadang recipe is interesting from that point of view as well. Then I found Indira using the combination almost in all of her recipes. So I have started doing this more often. It was! I promise it was! Achha, Unofficial Smiley Dictionary might come in handy for use on Google's not so smart Blogger. But you have to forgive them, they didn't build Blogger from scratch, they bought it and then made it what it is. It must be a Maharashtrian thing. My Mom always said chaar kihnva paach methi chya beeya, agdi mojoon (four or five methi seeds, counted carefully) as does my aunt. As for counting peppercorns, boy was that tough! I made my vangi bhath today and decided to refer to my recipe to see if I would do anything different today, given all the new influences in my life from states whose names start with K. I actually counted 15 black peppercorns and used them! Ah! the combo of of mohri/mustard and jeera :-D. So, Golden Girl never sues it, nor does her Aayi. But then we had our friends visiting:the guy from Andhra and his wifey from UP-they royally used jeera and mustard together, much to Golden Girl's irritation :-D. But the palak daal DC (the guy) dished out was something to be tasted! I think, it must be an Andhra thing, now that Anita mentions Indira using it very frequently. But then, i know of another friend who is a Kannadiga, but has spent most of her life in Pune-she and her Mom use this combination all the time. And, i have seen this combination in Aviyal too-Ms. Moon, my Malayali friend does it all the time. I think it comes form what is kosher for fasting food - mustard/mohri-heeng in peanut oil for everyday food, zeera, no heeng, and usually in ghee for 'fast' food...But zeera does add the extra zing. Another thing must be that zeera is probably not local to the Konkan region (? ), which must have made it pricey, and so it got kept for special occasions (I tell, you I can never spell this word correct - always shows up red underlined till I change it around a couple of times), as did the pricey ghee. But since Kobras (and the whole of Maharashtra) can't do without the peanuts (ample evidence all around :-) ) so that was allowed even though the oil was out! See, how I always bring it to the topic at hand? C'mon, peanuts were discussed at length in the post! The blushing one was way too cool,as was Ms :rolling eyes:! The Mustard/jeera thing is a more gujarat thing, me thinks. My cousin,brought up with lots of gujju influences, always uses the mustard+jeera combo, even for upma. I do not like it so much in upma but I do it for poha and I cannot think kadhi without rai/jeera tadka. What does it mean when you start noticing your own eccentricities? Your post brings back memories of the exam days, when I too used to sit with a 'wati' of 'Bhadang' by my side, helping to the peanuts from the 'dabba'. And Aai always made sure that the dabba was full. The masalas at the bottom of the dabba was another favourite bit, other than the peanuts. Golden Girl is smart, Musical. She could have lost the case if the judge and jury happened to be purists when it came to rai-jeera. I now! I just teasing! But then take a look at Nupur's Bhadang, that uses both but no hing. Those smileys are to be treasured. They are our history. They are from the era before everything became WYSIWYG. Vee, I am like you, too. It's phodni in Marathi, chaunk in Hindi, vaghar in Gujarati. When I'm with my Goan friends - someone please tell the western world that there is no such thing as Goanese - it's baghar. You are so right about the masala at the bottom. It's nutty and smoky from the popped seeds in the phodni and spicy and salty, too! We used to fight over it just like we fought over the slightly 'karaplela' or 'laglela bhath' at the bottom of the pot of pulao. Thanks for the advice about Rice Krispies Manisha. However, they are rather small as compared to the Basmati Kurmure. Also, as luck would have it (or maybe the popularity of your blog) the only Indian grocery shop here had no kurmures this weekend! Popularity of my blog, of course! It even made the Denver Channel's 10 minutes of non-stop local news. Mad rush from coast to coast to buy all varieties of puffed rice: mumra, murmura, kurmura, even Rice Krispies, branded as well as those sold where one must not shop...all because of a mouth-watering recipe posted in a nondescript blog called Indian Food Rocks based in the icy foothills. Vinay from Krishna Groceries was surprised to see the long line that had formed outside his store before he opened for business. When asked if he had heard of the Louisville blog, he shook his head but wished them "great success and more such recipes." When he was told that the owner of the blog shops at his store and that she had the Padosan DVD that was now overdue, his eyes twinkled as he said: Yes, her husband bought okra here recently. Popcorn with phodni is really good. Not weird at all. I had carried that to a friend's for a potluck. It was gone in minutes. No No Manisha not at all the amsul does not make the bhadang soggy and with the thick kurmure it goes really well. How much okra did he buy? I just got a couple of packets of better quality amsul, so I will try it, Anjali. Do you soak them before you add them to the phodni or just rinse and toss them in? Just rinse pat dry. Chop into bits for even distribution and toss into the phodni. this is not bhadang...these are normal churmure. Bhadang is special kind of churmure but little salty and with a plain outlook !! whaever ..I love both churmure chivada and bhadang !! Yummy !! Anjali, thanks! Will try it next time -which might be as soon as this coming weekend! i just visited this post tonight via your flickr photo. mmmmmm....this is a perfect snack. maybe i'll make some for my women's group meeting next time. Manisha, I tried this out yesterday & loved it. Thanks for sharing the recipe! after you shared that glorious chivda you made, i made your bhadang recipe for a little get-together i was having. my hubby and friends went wild! thank you for making me into a good indian wife (i tease!). my question, how do you get the yummy bits to stick to the rice well. the tumeric colored the rice, but most of the yummies fell to the bottom of the bowl. ps you are a total pusher and now luke and i are addicted to chivda and bhadang.